This Ragu alla Bolognese recipe is based on the traditional recipe for this classic meat sauce from Bologna, Italy, used for both pasta and lasagne. Follow my exacting ingredient list and cooking directions and the result will be a perfect ragù alla Bolognese. This Ragu alla Bolognese recipe – or more correctly ragù alla Bolognese – makes the rich and very moreish pasta sauce from the city of Bologna in Northern Italy that is known all over the world. It’s a recipe I go to when we’re in need of comfort food and by the looks of things, whether it’s the sub zero temperatures and snowstorms our European and North American readers are experiencing, or the coming of autumn in the southern hemisphere but our comfort food recipes have been the most visited on here in recent weeks. This ragu alla Bolognese recipe will also warm you up. Ragu alla Bolognese is one of the most misinterpreted dishes dishes in the world. While a carbonara sauce recipe is often abused with the introduction of cream, ragu alla Bolognese has all sorts of crimes committed against this staple of the Italian cuisine cannon. With carbonara the authentic/inauthentic lines are pretty well drawn. Definitely no to cream, but a grumbling okay to using pancetta if you can’t get guanciale. Problem solved. But when it comes to ragu alla Bolognese, the universality of the dish and its localised interpretations leaves us with a collection of recipes that is the Italian cuisine’s version of Chinese whispers. Here’s how to make the traditional ragu alla Bolognese recipe from Bologna which begins with a classic Bolognese sauce. The original Bolognese sauce starts with beef skirt steak, pancetta, equal amounts of carrot, celery and onion, tomato paste, milk, dry wine and seasoning, according to the Accademia Italiana della Cucina. It ends up with a 400 grams tin of Spaghetti Bolognese on a supermarket shelf in England, the USA or Australia – including a whole tomato in each tin to add insult to injury. I’ve even noted a recipe for Thai Red Curry ‘Bolognese’ that makes me loose faith in humanity. So how did we get here? Firstly, let me say that no two home cooks in Bologna even make their ragù alla Bolognese to the same recipe. Tomatoes, chicken livers, pancetta, or pork mince alongside beef are just the beginnings of a post-lunch argument over the dish in Italy. The response from any chef north of Florence was “yes, of course!” while every chef south of Rome exclaimed “what? !” and as well as some other choice words that I recalled from working with Italian males from Calabria in Australia. With the series of recipes of what we make as ‘comfort food’ ragù alla Bolognese is one of my favourites. I started off with this recipe after eating sublime versions of this ragù in Bologna many years ago. Mario Batali (yes, I know he’s persona non grata these days) was the only chef I could find who had a ragu alla Bolognese recipe that tasted anywhere near as good as the ragu alla Bolognese we at the restaurants revered for it in Bologna. But the chef had several recipes floating around that differed in the use of tomatoes and the order of adding ingredients. After cooking to a couple of dozen ragu alla Bolognese recipes in the years since our time in Italy and taste testing with Lara – who never complained once – I came to my own conclusions as to which ragu alla Bolognese recipe suited our taste and, just as importantly, had the richness, depth of flavour and texture of the classic Bolognese sauce that what we remembered from our time in Bologna. Here’s how I ended up with what we consider to be our favourite ragu alla Bolognese for use with both pasta and lasagne. Beef, Pork, Pancetta, and Chicken Livers? Yes to beef, pork and pancetta, but chicken livers always tended to weigh the dish down a little. If you get the ragù browned enough before adding the milk there’s plenty of depth of flavour. Regardless of how you manage your ratios of beef to pork (and I believe you need both), I would suggest having at least 40% pork in some form in the sauce. It should not be contentious that a little garlic is added to the sauce, but it is. I’m firmly in the camp that garlic is fine as long as it’s added after the vegetable mix and not allowed to burn. I don’t mind if it’s left out. As for herbs, oregano, basil and parsley have no place in this sauce. And no, not even for decoration. I’ve gone back and forth over the use of tomatoes, but never the use of tomato paste in a classic Bolognese sauce. The paste adds a richness and depth to the sauce, particularly when cooked out in the ragù. Tinned tomatoes, in my opinion, are used to pad out the sauce as a simpatico ingredient that won’t offend – quite common in restaurants where they’re trying to stretch the sauce out. For me, the ragù is sweeter and looses a little depth with even a 400 gram tin of even the best Italian tomatoes. However, here’s a caveat that I must confess to: if we’re making lasagne with ragù Bolognese the next day, I’ll sometimes add volume to the ragu with a tin of tomatoes that’s combined and cooked out with the ragù. But for a beautiful tagliatelle with ragù alla Bolognese, no tinned tomatoes. If you want to use more tomatoes, try a Neapolitan ragù. Milk or no milk in a ragu alla Bolognese recipe is much discussed. Definitely milk. Once the mince and the vegetables are browned sufficiently, there’s a chance that pieces that have ‘catched’ (a nice term for slightly burnt bits that stuck to the bottom of the pan) will leave a bitter element to the dish. It was explained to me by chefs in Italy countless times that the addition of milk helped ‘smooth’ out the flavours of the ragù and tenderise the meat. As someone who is obsessed with cooking the ragù out until quite browned (see below), I can confirm that the milk definitely does take a little bitterness out the sauce, but I’m still not sure about the tenderising aspect. Yes and yes. I’m a firm believer in adding a glass of dry red wine from the region (try Sangiovese or Barbera) to this classic Bolognese sauce after the milk. As I’m not using a dark brodo (stock), I prefer red rather than white wine. Regardless, it should be dry wine, not sweet or frizzante. The stock is necessary if you’re not cooking the ragù with tinned tomatoes and its associated juices. I prefer a light chicken stock because if you’ve browned the meat as above, you’re not going to need a dark beef stock to finish the sauce. Lid on, Lid off and Cooking Times? This doesn’t get mentioned enough – or at all – in ragu alla Bolognese recipes. Lid on for the first half of cooking marries the flavours and doesn’t let the sauce dry out. Shifting the lid during the second half of cooking reduces the sauce without – hopefully – having to add too much extra stock. So for me it’s 1 1/2 hours lid on, and 1 1/2 hours lid off. It’s that simple. Whenever I have made this ragu alla Bolognese recipe or any pasta recipe for that matter for a dinner party, almost every time a guest will come into the kitchen and ask “how did you stop the pasta from sticking together?” Firstly, I don’t use oil. Do not waste good olive oil in pasta water. Secondly, use one litre of water per 100 grams of dried pasta. Pasta water should be “salty as the sea”, as the Italians like to say, so 3 tbsp salt for four servings. You need the water on a rolling boil before you put the pasta in. Once the pasta is in, start your timer and stir the pasta for the first couple of minutes. Place the lid back on to get the water back up to a boil, then put the lid off slightly to help stop the pasta boiling over. Take the pasta out of the pot one minute before the packet time, so if the packet says 8 minutes, turn off the heat and remove at 7 minutes. The reason for this is that the pasta will still be cooking in the sauce, so when it hits the table that extra minute of cooking time will result in perfect pasta. Depending on the pasta type you can use tongs or a ‘spider’ to remove the pasta. Dump your pasta into the ragu Bolognese sauce, which you should have over a medium heat. Never take a whole pot of pasta and strain it over a sink. We want pasta water on the pasta. Once the pasta is all in, stir the pasta well through the sauce. Whenever I see a photo of ‘spaghetti Bolognese’ with the sauce sitting on top of pasta that’s clearly been drained and strained, I die a little inside. The spaghetti will be cold because you’ve had to plate it individually first and chances of getting a good mix of sauce and pasta on a flat plate that’s already full is gone. This ragu alla Bolognese recipe makes a classic Bolognese sauce for a hearty, rustic dish. It ain’t meant to be pretty, just tasty. Mix the pasta with the sauce and serve it on warm plates or bowls. Your fellow diners at the table will thank you. This ragù alla Bolognese recipe is based on the traditional recipe for this classic meat sauce from Bologna used for both pasta and lasagne. 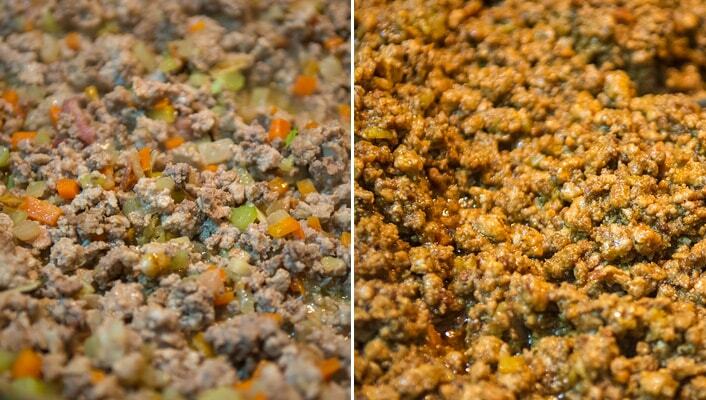 With an exacting ingredient list and cooking directions, this will result in the perfect ragù alla Bolognese. Before you start, get the mince up to room temperature. In heavy-bottomed saucepan or Dutch oven, add the pancetta and cook until crispy. Remove from the pan and set aside. Add the olive oil and butter to the fat over medium heat. Add the onion, celery and carrot and sweat down until the vegetables are translucent. In the meantime, combine the two portions of mince together in a large bowl. Add a little olive oil and, using your very clean hands, combine the mince. Add the garlic to the vegetables and stir for one minute to combine. Do not let the garlic burn or it will make the finished ragù bitter. Add the pork and beef mix and stir into vegetables. Brown over medium-high heat, stirring to keep meat from sticking together. This should take 15 to 20 minutes, so be patient, it’s worth it. Once the ragù is browned, add the tomato paste and work into the ragù until the paste ad really deepened in colour. Add the pancetta back into the ragù. Add the milk and simmer while stirring until the milk is reduced, around 2-3 minutes. Add the stock, bring to a boil and then lower the heat as low as you can go. Put the lid on the pot and simmer for 1½ hours, stirring every 15 minutes. Remove the lid slightly and simmer for another 1½ hours, moving the lid every 15 minutes until fully off. If the ragù is starting to dry out add some more stock or water, just enough so that you can see liquid bubbling around the ragù. The final ragù should have a film of oil around the pieces of mince. It should bubble around the sauce. If not, add more stock. Season to taste and serve with 500 grams fresh tagliatelle or 400 grams dried egg tagliatelle. For a larger serving, try 600 grams fresh tagliatelle or 500 grams dried tagliatelle. As a guide, we use 150 grams ragù per person for a small serve and up to 180 grams per person for the larger size. Are you a ragù alla Bolognese lover? Do you have a favourite ragu alla Bolognese recipe for this classic Bolognese sauce? Milk or no milk? Finally a ragu recipe that weighs the ingredients in grams rather than ‘two carrots, two ribs of celery’. And that tip on the timing of the ‘lid on, lid off’ for the sauce is great. Mine turned out fantastic, but I had to resist the urge to add the tomato paste and milk (milk! who knew) before the meat had really browned off. Great recipe, well worth the time and effort! Hey Kerry, thank you. Yeah ingredients lists that say ‘one onion’ and so on are a pet peeve of mine. Glad it turned out well. Thank you for your recipe, I was wondering when to put the pancetta back in? Oops, thanks for picking that up. After the tomato paste is worked into the ragù add the pancetta. I’ve amended the recipe to add that step.